We find them growing in fields, on parks, lawns, even between our toes, but most of us commonly associate fungi with woodland habitats. At this time of year, our forests are positively bulging with them. Far from the view of their mushroom and toadstool fruiting bodies, their mycelial root system of thread-like hyphae are crucial for breaking down fallen leaf litter and decaying dead wood, returning once living matter to the soil. Some, like the Armillaria or Honey Fungus, are less beneficial, parasitising living trees, stunting their growth and even killing them outright. Others however, play a much more crucial role in our woodland ecosystems. These are the mycorrhizal species. The term mycorrhiza comes from the Greek words “mykos” for fungus and “rhiza” for root, and describes the types of fungi that form symbiotic relationships with plants. Those that penetrate plant root cells are called endomycorrhizal or arbuscular mycorrhizal fungi. 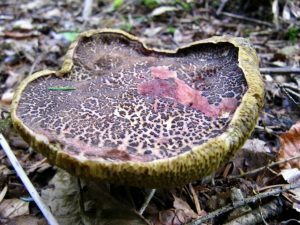 The plant effectively plays host to the fungi, but thrives as the fungi supplies it with vital nutrients and water that it can’t easily capture itself. It is this type you nowadays find mixed in with a number of organic composts on the market to give your lawns and garden veg a boost. In an ideal world, one wouldn’t need them, as they occur naturally enough in soil systems that aren’t overly cultivated or soused with fungicides and chemical fertilisers. Not that you’d notice them though, as they don’t form visible fruiting bodies. In contrast, the ectomycorrhizal fungi do form fruiting bodies, and in the case of the many various species that form mycorrhizal relationships with trees, particularly striking ones at that. In ectomycorrhizal associations, the hyphae grow around the surface of the root in a dense coating, also extending from the root system to reach down to the deeper parts of the earth. Different species tend to be associated specific types of tree, adding another possible indicator for positive identification. The Saffron Milkcap (Lactarius deliciosus), for example, is usually found growing under pines. The nature of these specific underground relationships make cultivation a tricky business in most instances, hence their value to collectors (although scientists are still trying ). It is a shame, as some of our best-loved edibles are ectomycorrhizal. 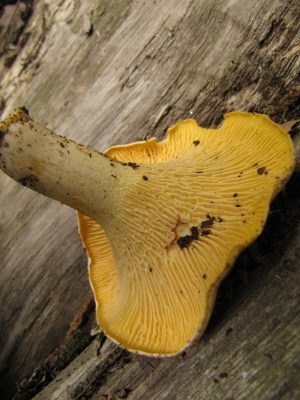 The Chanterelle (Cantharellus cibarius), or girolle, is one of the most readily identifiable, with its bright yellow to light orange colouring, characteristic trumpet shape and ‘false gills’ (or ‘pseudo-gills’, as they cannot be removed from the cap without damaging it) formed of irregularly-forked, vein-like ridges that run down to where the stalk, or stipe, begins. These are usually found in late-Summer to late-Autumn, and predominantly in coniferous forests, although they seem relatively promiscuous in their liaisons and can also be found with beech and birch trees. 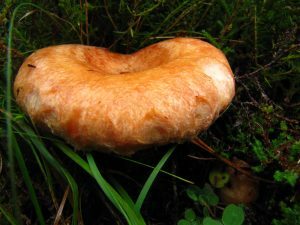 Virtually all of the boletes form ectomycorrhizal relationships, notable its tastiest exemplar, the Penny Bun (Boletus edulis), also known as the porcini, cep, Steinpilz or Edible Boletus. 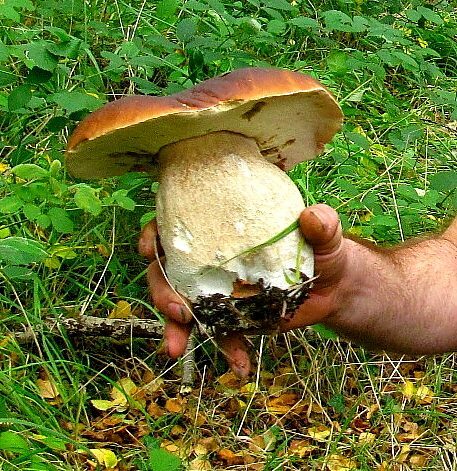 These can reach quite a substantial size, the shiny yellow-brown to dark brown cap reaching to 25cm across, the conspicuously fat and bulbous stem growing up to 20cm in length and sometimes 10cm in width. They tend to grow either single or in small groups of around two or three, and associate with various pines, firs and spruces, but like the Chanterelles, also range to other host trees – unlike the thinner-stemmed Birch Bolete (Leccinus scabrum), which as the name makes abundantly clear, only forms mycorrhizal partnerships with birch. 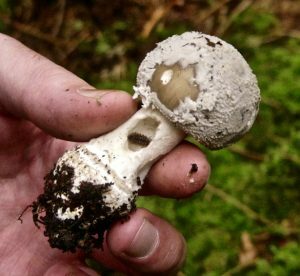 Another giveaway to identification is its white flesh and the fact that its spores are released from pits rather than gills. This spongy, pored underside is a characteristic of all boletes, so it is not a great idea to go by this alone as a means of positive identification for Penny Buns. Other boletes can either be profoundly unpleasant to the palate, such as the Bitter Boletus (Tylopilus felleus) and Peppery Boletus (Chalciporus piperatus), or poisonous, like the aptly-named Boletus satanas, or Devil’s Boletus. The Devil’s Boletus stinks like rotting meat and signals its toxicity via a network of red veins that cover its yellow stem, eventually turning the whole thing blood red. Interestingly, when you bruise or cut it, the white-to-yellow flesh turns blue, a feature it also shares with other species such as the Red Cracked Bolete (Boletus chrysenteron) [image adjacent]. This one is edible, but really the same caveat applies with all foraging: Stick with the advice of experts, and if you are not completely sure what you have found, just leave it. In fact, you are best off leaving all of the boletes, as over-collecting is making the edible species rather scarce in many parts. The various ectomycorrhizal species produce not only some of the tastiest fruits of the forest, but also some of the deadliest. Fortunately most are distinctive enough that you’re unlikely to confuse a Chanterelle with the lethal Destroying Angel (Amanita phalloides), Death Cap (Amanita phalloides), or Panther Cap (Amanita pantherina) [image adjacent], all members of the Amanita family. 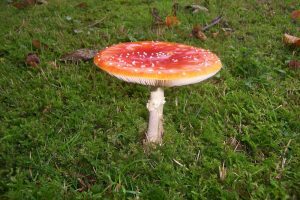 All Amanita species commonly found in the UK are ectomycorrhizal. The first two of these are slightly nondescript-looking to the non-expert, with the pure-white Destroying Angel sometimes mistaken for young button mushrooms or puffballs in their early stages of growth. The sickly yellow-green tinge of the Death Cap, on the other hand, in itself should be enough to warn anyone off. The spotty grey cap of the Panther Cap makes it easily confused with certain edibles like the Blusher (Amanita rubescens) and the Grey Spotted Amanita (Amanita spissa), but honestly, who would even bother? Get it wrong and you’re dead. You are better off just buying punnet of mushrooms from your greengrocer. The other thing that is essential to remember is that if you see holes in the fruit bodies where insects, slugs or perhaps larger creatures such as squirrels might have been chewing, this is definitely NOT a signal that they are fit for human consumption. We have markedly different neurosystems. 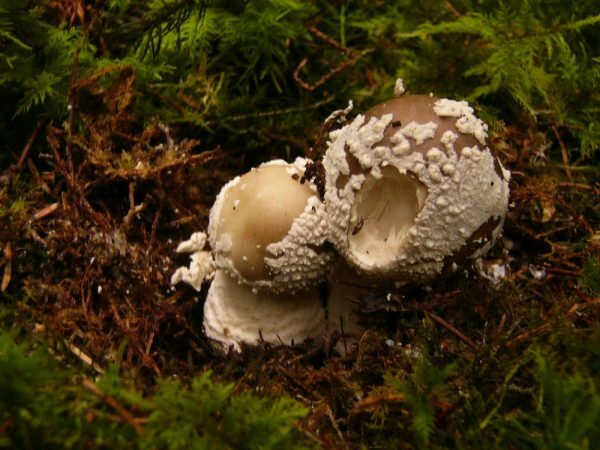 There are numerous ways to identify Amanita, the key points being that virtually all have white gills, and that when young they emerge from an egg like sac, called a universal veil. 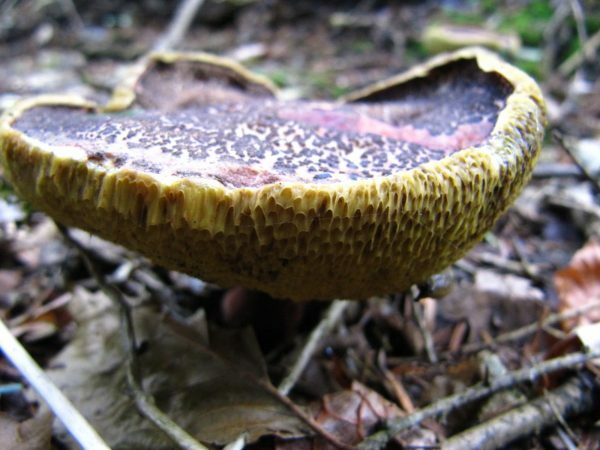 Even when fully grown, skin-like vestiges of this remain on the stem and cap (in white warty patches), and the bulbous base from which the fruiting bodies have “hatched”. Most retain a ring around the top end of the stem, remains of a partial membrane that covered the gills when the mushroom was still growing. [The reader might like to take a 'side turning' and redirect to this incredibly useful guide that gives some helpful starting points]. 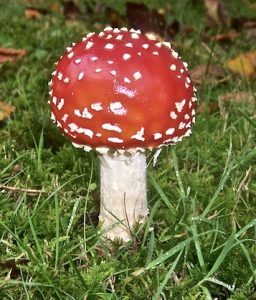 The easiest species to pinpoint however, is our Monthly Mushroom for November, the Fly Agaric (Amanita muscaria). 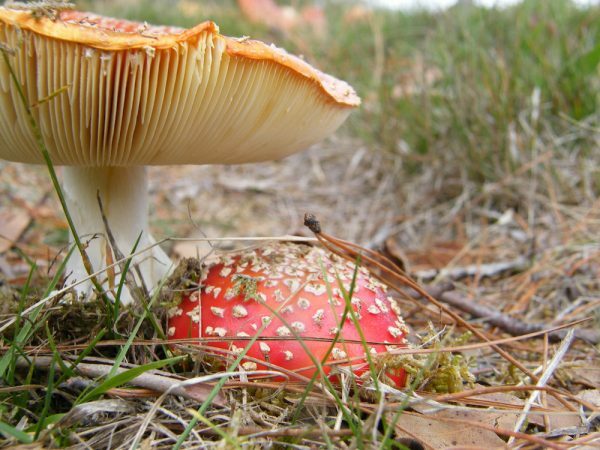 With its white stem, and orange to scarlet cap dotted with the white warty flakes remaining from its universal veil, it is instantly recognisable (see featured image above) as the toadstools of folklore and fairytale, and it appears in association with a wide variety of different trees, mainly coniferous (although Helmut and Renate Grunert’s ‘Field Guide to Mushrooms of Britain and Europe’ claims it is “common under birch”). It is also, one perhaps need not add, highly toxic. While some might point to its reported hallucinogenic properties through its association with witches potions, shamanistic ritual and even the early foundations of Christianity according to a man named John Allegro, author of the controversial 1970 book ‘The Sacred Mushroom and the Cross’, this is about as suitable for recreational use as a pint of meths. The tribes of the Siberian tundra who reputedly used it for their vision quests made sure to filter it through the kidneys of their reindeer herds before intoxicating themselves - quaffing the beasts’ pee. The english common name apparently derives from its use in days-gone-by as fly killer, with the cap left in a bowl of milk to attract airborne kitchen critters. It is debatable how efficient a method this might have been, as one often finds them teaming with insect life. Most of the Amanita family might not be much use to humans, but they certainly are a boon to trees. An article in Scientific American revealed the recent discovery that not only do they not cause rot, but they can’t, having lost the enzymes necessary to break down cellulose to feed on. The Amanitas can’t even decompose leaf litter. In fact, they are completely reliant on their hosts to provide them with the carbohydrates such as glucose and sucrose they need. In return, as mentioned, the tree gets access to vital minerals and water via the far larger surface area provided by the fungi’s hyphal root system. Everyone is a winner. There is one further theory as to how vital these mycorrhizal fungi are to forest ecosystems, which is the “Mother Tree Hypothesis” . These hyphal networks not only serve the benefit of a single tree, but link whole forests, allowing the plants within them to share resources as these shift carbon, water and nutrients between them, mediated by the largest “mother” nodes in the matrix. It is an astonishing wake-up call for those who have misleadingly read Darwin’s theories of evolution purely in terms of survival of the fittest. In nature, cooperation is far more common than competition.